A few years ago I remember making myself a mental note to get the debut of San Diego residents Benedictum after hearing their song on some compilation. The music was very old school and the power of the vocalist was undeniable. The time came and went and I never followed up on that mental note, having not crossed the paths with Benedictum until now. This traditional metal US band is now on their third album, and the first impression is still the same. 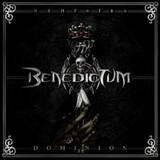 Benedictum is trying to keep the banner of classic heavy metal flying, and their vocalist is still impressive. For those who don’t know, and you may not be able to discern it if you only hear bits and pieces of Dominion, Benedictum is led on vocals by one Veronica Freeman, a monster of a female singer. She can do it all, soar in At the Gates and Seer, growl in Grind It, be very Doro-like in Grind It and Dark Heart, let out the Halfordian scream “it is over” in Prodigal Son, or all of the sudden reveal some sensitive woman’s touch at the beginning of Dark Heart and throughout Loud Silence. To have such an imposing figure at the forefront is both the blessing and the curse for Benedictum. For one, Veronica’s voice is capable of saving any song. At the same time, any producer feels that he has to pull back on the rest of the crew and let Veronica dominate (the name of the album calls for it anyway). As such, the riff explosion on the title track, galloping on At the Gates and Prodigal Son are never oversaturated in terms of guitars or rhythm section. The production of these songs and many others reveals a lot of pores into which Veronica’s powerful voice inevitably seeps in. To bring further heaviness and power into the music, the band relies on slight downtuning and grooves, a little modern style mud thrown into otherwise trend defying heavy metal of Benedictum. Guitarist Pete Wells can no doubt compose and hold the riff, but he is almost forced to showcase his shred-ability in piercing squealing solos (Grind It, The Shadowlands) or long intros (Epsilon) or pure instrumentals (Beautiful Pain). It is there that you feel something progressive or downright Malmsteeny guitar hero is not a strange guest in Pete Wells’ clubhouse. The first half of Dominion, including the instrumental Beautiful Pain, is like a good boxer, hitting you with short punchy songs not overstaying their welcome. And as soon as you think that, the song sequencing and their length begins to puzzle. Back-to-back you can get a dark, old Warlock and Savatage inspired Dark Heart; raucous causing, crowd riser Twisted Sister rocker Bang; not too cheesy, but certainly a ballad Loud Silence; progressive lengthy Epsilon and country strummed strange choice Sanctuary. Way too much variety towards the end of the hour-long album tends to muddle up the feeling of the straight up metal warriors from the album opening moments. Stuck between their classic heavy metal upbringing and almost the commercial desire to fit in nowadays Benedictum is certainly an interesting listen, but it is those old school moments I detected way back is what still attracted me the most now that my acquaintance with Benedictum grew closer.